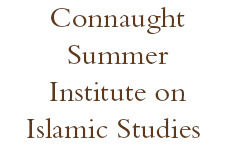 The University of Toronto’s Connaught Summer Institute on Islamic Studies is a three-year collaboration between the Faculty of Law and Emmanuel College to support graduate research and forge new ground in the study of Islam. The Summer Institute will bring faculty and pre-dissertation graduate students together to scrutinize how the subjects that fall under the various labels of “Islamic Studies” or “Muslim Studies” are framed. The CSIIS uses CEDAR pedagogy to bring international participants together to explore what it means to study and live together differently within the Muslim collectivities in the Greater Toronto Area.